In 2016, there were 43.7 million immigrants in the United States. That's 13.5 percent of the total population. About 1 million immigrants a year receive green cards that allow permanent legal resident status. Immigrants live with 16 million American-born children who are U.S. citizens. Those immigrants and their families make up 25 percent of all U.S. residents. Almost 75 percent are documented immigrants and their children. Immigrants have less education than the average American. But that's improving. For example, thirty percent of immigrants, 25 and older, lack a high school diploma compared to 9 percent of native-born adults. But that's better than in 1970 when more than half of immigrants lacked a high school diploma. Furthermore, 30 percent of immigrants have a college degree. That's similar to the 32 percent of native-born counterparts. Forty-seven percent of immigrants who entered between 2012-2016 have that degree. In 2016, there were an estimated 10.7 million undocumented immigrants in the United States. That's 3 percent of the U.S. population of 320 million and 25 percent of the immigrant population. Half of them have lived in the United States for at least 14.8 years. The number of undocumented immigrants has tripled since 1990, when there were 3.5 million in the United States. But it's down from a peak of 12.2 million in 2007. The recession didn't hit Mexico as hard as it did the United States. In 2016, there were 7.8 million undocumented immigrants in the workforce. That's down from 8.2 million in 2007. They are mostly in farming and construction. Almost half or 3.4 million pay Social Security payroll taxes. In 2010, they and their employers contributed $13 billion. They do so even though they are not eligible for Social Security benefits upon retirement. They do this by using outdated Social Security numbers or an Individual Taxpayer Identification Number. They hope that paying taxes will one day help them become a citizen. The Department of Homeland Security found that 15.5 percent of undocumented immigrants benefit from Medicaid. Around $2 billion a year goes to hospitals who must care for anyone who shows up at the emergency room. It's similar to the 16.1 percent of native-born Americans who use Medicaid. The study found that 9.1 percent of undocumented immigrants used food stamps, compared to 11.6 percent of native-born. Many undocumented immigrants receive the benefits because they live in households with eligible Americans. Use of welfare is negligible, less than 1 percent, for both populations. Half are the undocumented immigrants came from Mexico, a little less than the 57 percent in 2007. At the same time, the number from Asia, Africa, and Central America has increased. One reason for the shift is an improvement in Mexico's economy. At the same time, crime in Honduras soared after Salvadoran drug gangs took over. The illegal drug trade to the United States moved there from the Caribbean. In 2013, the Department of Homeland Security deported a record 434,015 immigrants. The Obama administration deported 2.4 million, and of those, nearly half had a criminal record. It sent home more in its first five years than the Bush administration did in eight years. That's despite deportation relief for 580,946 young immigrants under Obama's Deferred Action for Childhood Arrivals. There were 1.9 million "removable criminal aliens." That includes both legal and illegal immigrants. President Donald Trump promised to deport them immediately. In 2016, the U.S. Border Patrol apprehended 415,816 immigrants. U.S. law requires the government to allow anyone who shows up at the border to apply for asylum. They are referred to an asylum officer who determines if they have a “credible fear” of persecution or torture in their home country. Immigrants already in the United States can also apply for asylum to prevent deportation. In 2015, the government granted asylum to 26,124 applicants. Once immigrants get approved for asylum, they can stay in the United States. They receive authorization to work and apply for a Social Security card. The can apply for Medicaid or Refugee Medical Assistance. They can also petition to bring family members to America. If the asylum officer doesn't find a credible fear, they order deportation. The refugee can appear before a judge to challenge the finding. In March 2018, there was a backlog of 690,000 deportation cases under review. Since November 2018, the number of migrant families applying for asylum at the U.S. border has increased. Homeland Security does not have the funding to process the new surge. Many are showing up in remote areas. One reason for the uptick is an increase in drug-related violence. Crime in Honduras soared after Salvadoran drug gangs took over. The illegal drug trade to the United States moved there from the Caribbean. The goal of Trump's immigration policies is to reduce the number of undocumented immigrants in the country. One reason there are so many undocumented immigrants is that it's so difficult to immigrate with authorization. There are 4 million people on immigration waiting lists. Almost 150 million people who would leave their country if they could and move to the United States. The Trump administration wants to eliminate the appeals process for asylum seekers. Instead, it wants to criminally charge anyone who shows up at the border without documentation. It also briefly separated children from their parents to discourage other undocumented immigrants. In November of 2018, the Trump administration vowed to send 5,800 troops to the Mexico border. He sought to defend the U.S. border from a caravan of thousands of Honduran refugees. They were seeking asylum from dangerous conditions in their home country. They banded together to protect each other on the dangerous trek and avoid using human traffickers. In response to this surge, the United States temporarily closed the border to Mexico. Customs agents fired tear gas at members of the caravan who had rushed the border fence. On December 20, 2018, Trump refused to sign a budget bill because it lacked $5.7 billion to build a wall on the border with Mexico. As a result, nine federal government agencies shut down. In 2015, the U.S. granted 69,920 immigrants refugee status. A refugee applies for protection from persecution while still in their home country. If granted protection, the refugee can live in the United States as long as their home country remains unsafe. They receive a work permit and other government support. After one year, they can apply for a green card. 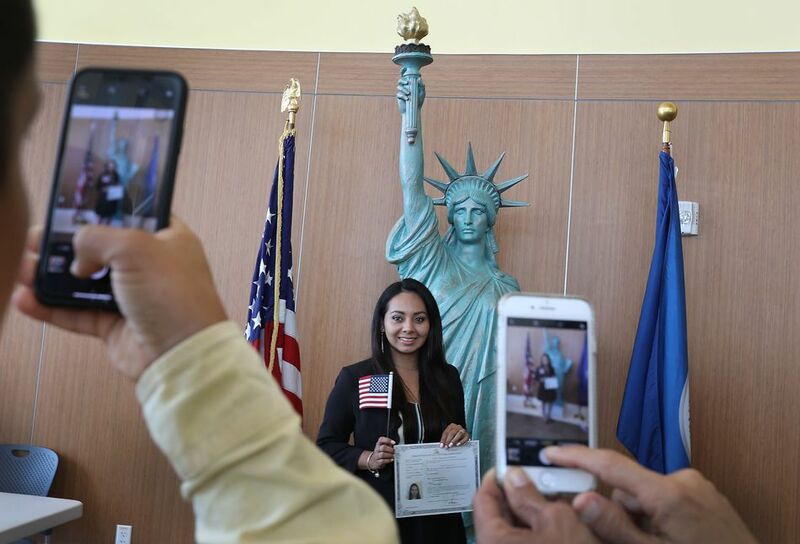 After four years, they can apply for U.S. citizenship. The Trump administration proposes to cap the number of refugees at 30,000 in 2019. In 1924, Congress established national-origin quotas with the Immigration Act of 1924. It awarded immigration visas to just 2 percent of the total number of people of each nationality in the United States as of the 1890 national census. It excluded all immigrants from Asia. People were anxious because of World War I and heartily supported limits on immigration. By 1970, immigration had fallen to a low of 4.7 percent of the population. That was down from a high of 14.7 percent in 1910. In 1965, President Lyndon Johnson pushed Congress to change immigration policy with the Immigration and Naturalization Act. It eliminated quotas based on nationality. Instead, it favored those with needed skills or who were joining families in the United States. That increased immigration from Asia and Latin America. In 2014, America welcomed 1.3 million new immigrants. That's up from 1.2 million in 2013. India sent 147,500. China, which sent 131,800 people, and Mexico, at 130,000, were almost tied. So were Canada at 41,200 immigrants and the Philippines at 40,500 individuals. Today's percentage of immigrants is similar to the late 19th century when almost 15 percent of U.S. residents were immigrants. Most were from Italy, Germany, or Canada. They were tailors, stonemasons, and shopkeepers with skills needed by the United States. Those who remained in America for at least 15 years were just as likely to own businesses as the native-born. Their children were just as likely to be accountants, engineers, or lawyers. Immigrants have driven two-thirds of U.S. economic growth since 2011. They founded 30 percent U.S. firms, including more than 50 percent of startups valued at over $1 billion. Although they've helped the economy overall, the benefit is largely in certain industries. Immigrants with advanced degrees gravitate toward scientific and technical jobs that don't require high communication. Newly arrived immigrants have one thing in common that reduces their ability to compete with native-born workers. They generally don't speak English as well. That means they are less likely to take jobs that require strong communication skills. For example, natives in management and media don't face a lot of competition from newly arrived immigrants. Immigration has a negative effect on workers without a college degree. That's especially true in agriculture and construction. In 2014, immigrants held 43 percent of agricultural jobs. Twenty percent were documented, according to the Pew Research Center. In building and grounds maintenance, 35 percent of the jobs were taken by immigrants. Nineteen percent were documented. In construction, 27 percent of the jobs went to immigrants, and 12 percent were documented. In those industries, immigration lowers wages and drive out native-born workers in those areas. That pushes native-born workers into jobs like sales and personal services that require superior communication skills. What hurts some workers helps consumers. Immigrants lower the price of goods and services for everyone. That’s because they provide low-cost labor that allows companies to reduce the prices of consumer goods. Immigrants in the workforce pay taxes into Social Security and Medicare. It improves the age dependency ratio. That's the number of working people who support the nation's senior population. The ratio is worsening because the U.S. born population is aging. There aren't as many in the working age population to support them. As more immigrants enter the workforce, the age dependency ratio improves. Contrary to other claims, immigrants are not more likely to commit crimes than the native-born population. Immigration dropped during the Great Recession and has not returned to pre-recession levels. Instead, immigration from Latin America may continue to weaken. Researchers from the University of California, San Diego, found there are two reasons. First, the economies of Latin American countries continued to improve. As a result, there isn't as much of an income gap between those countries and the United States. Second, the baby boom continued through the 1970s. There weren't enough jobs to employ all those young workers entering the labor force in the 1990s. But the economies have had enough time to absorb these workers in the last 20 years. As a result, there isn't the same demographic push sending immigrants to the United States. Immigration from Latin American will increase as global warming worsens conditions in Latin America. The World Bank estimates that climate change could send 1.4 million people north by 2050. Drought, shifting rain patterns, and extreme weather destroys crops and leads to food insecurity. The World Food Program found that nearly half of Central American immigrants left because there wasn't enough food.